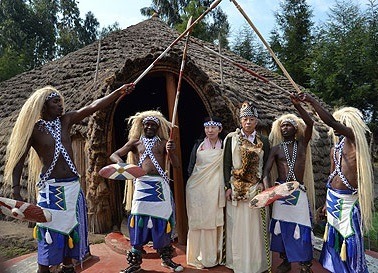 Following a range of years of dependence on Rwanda gorilla trekking safaris, the Rwanda Development Board started on the move to revive the culture of Rwanda along with its traditions so as to keep the interest of undertaking the safaris in Rwanda strong. The Rwanda Development Board marked the start of this move with the launch of the Cultural Tourism Guide book on 27th Sept when the country joined other member states of United Nationals World Tourism Organization to jubilate the World Tourism Day. The Tourism Chief Officer at the Rwanda Development Belize Kaliza notes that there is a need to enhance tourism product diversification to complement the country’s long selling gorilla tourism where the world travelers have been undertaking gorilla safaris to Rwanda to explore the critically endangered mountain gorillas. Considering the fact that tourism plays a significant role in generating knowledge and enhancing cross cultural dialogue, the development of cultural tourism in Rwanda is long overdue. The book termed as the Cultural Tourism of Rwanda which showcases the culture of Rwanda, the Rwandan traditions, the Rwandan genocide of 1994, food and drink, the Rwandan ceremonies and customs, Rwanda events and festivals, the Rwanda art and craft and Rwandan dance and music will itself be a rich guide to the Rwanda safari undertakers interested in culture. The Cultural Tourism Guide book of Rwanda features both English and French versions a soft copy will also be availed on line. The 325 page book brings out the cultural potential of Rwanda and its capacity to lure the world travelers into planning safaris to Rwanda. Rwanda is a haven of culture. The uniqueness of the Kinyarwanda traditions and the love that the Banyarwanda people have for their culture makes the cultural tourism in Rwanda not only possible but also sustainable. Kigali city alone features a range of cultural and historic sites that range from local markets to community encounters and the artiste’s cooperatives among others. Some of the notable sites include the Kigali genocide memorial located in Gisozi and known to be the heavily visited site of genocide, the Uburanga Art Studio which is a re-known artists’ home producing a range of paintings and the sculptures that have moved the art of Rwanda a mile. Others include the local markets like Kimironko where the travelers on safari in Rwanda can find the hips of floor and spices align with piles of the sambaza fish extracted from Lake Kivu.